Set to kick off their first homestand since the All-Star break on Monday night at Citi Field, the New York Mets (52-45) will have to wait another day to take on the St. Louis Cardinals (52-46). 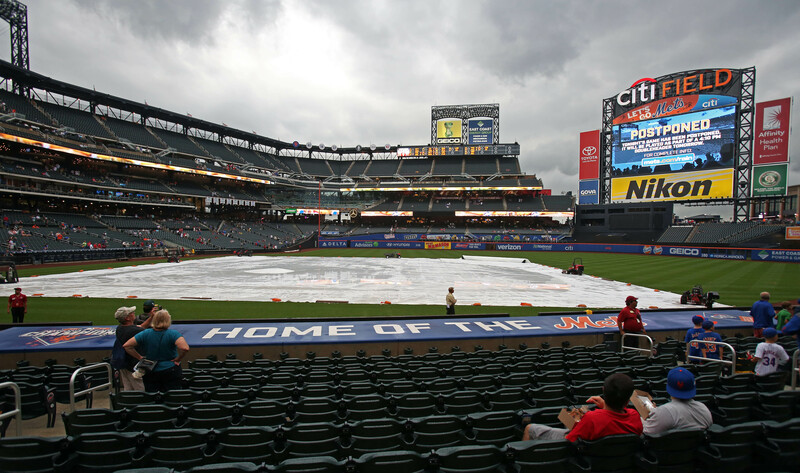 The series opener was officially postponed just minutes before the scheduled start time, as heavy rains continued to move throughout the tri-state area. The teams will play a single admission doubleheader on Tuesday, with the first game set to begin at 4:10 PM. With the non-waiver trade deadline a week away, speculation is rampant about whether or not the Mets will make any significant additions to the roster for what could be a tumultuous stretch run. Heading into Tuesday’s action, New York sat five games behind the Washingon Nationals in the NL East and tied with Miami for the second wild card spot. Baseball Prospectus’ playoff odds still see the Mets as the most likely second Wild Card, though the same Cardinals they face today and tomorrow aren’t far behind. Monday night’s scheduled starters face off in game one on Tuesday afternoon. Right-hander Noah Syndergaard (9-4, 2.43 ERA, 3.6 WARP) will hope the late afternoon shadows can help him navigate a Cardinals lineup that ranks first in the NL in home runs and RBIs. Syndergaard earned a no-decision at Wrigley field last Tuesday in the Mets 2-1 victory, scattering seven hits and allowing one unearned run over 5 2/3 innings while striking out eight Cubs. Righty Carlos Martinez (9-6, 2.83 ERA, 2.6 WARP) looks to win his third straight start and become St. Louis’ first pitcher with double-digit victories this year. Manager Mike Matheny hopes to get a long outing from the 24-year-old known as “Baby Pedro”, as his bullpen was forced to hurl 20 2/3 innings during the team’s weekend series against the Dodgers. Lefty starter Jaime Garcia (7-6, 3.98 ERA, 1.7 WARP) is slated to take the hill for St. Louis in the nightcap, opposed by the right-handed Bartolo Colon (8-5, 3.48 ERA, -0.1 WARP). David Wright and his wife Molly celebrated the birth of their first child, Olivia Shea, on Saturday. Baby, Mom and Dad are all reportedly doing well. Mets General Manager Sandy Alderson spoke to the media on Monday afternoon about his club’s potential activity leading up to the non-waiver trade deadline. He also tried to temper expectations concerning the Mets making a big splash at the deadline like they did in 2015.